It’s easier than ever to sequence your genome. For as little as ninety-nine bucks, companies like 23andMe mail you a plastic vial for you to spit in, sequence your DNA, and send you the results. From that half teaspoon of saliva, you can learn the ethnicities of your ancestors, and what diseases you might develop. Do you live your life differently knowing more about where you came from, or that you may get sick some day in the future? Rochman has been reporting on the intersection of genetics, parenting, and pediatrics for Time and other well-known publications since 2011, and has herself struggled with the results of her own children’s genetic testing. Following an unusual ultrasound, Rochman agreed to test her third child for trisomy 18, an abnormality involving an extra copy of chromosome 18. The test results came back negative, but also uncovered a different DNA irregularity known as an “inversion.” Although the lab assured her that there are no illnesses known to be associated with this inversion, Rochman couldn’t resist paging “Dr. Google,” which led her to an obscure online article that linked this abnormality to schizophrenia. Now whenever her toddler throws a tantrum, Rochman wonders if it’s because of the genetic abnormality… or because she’s two years old. Her experience with testing-induced anxiety highlights the challenge of our new genetic age: How do we deal with the gap between a possible future and a certain one? All any parent wants is a healthy, happy baby — and new genetic technologies have expanded our ability to guarantee this will be the case. We can screen for genetic diseases before, during, and after pregnancy. We can pick embryos free of known genetic abnormalities to get a healthy baby from the start. And with the new gene-editing technology called CRISPR, we may even be able to repair our children’s DNA after birth. The first step in gene editing of a human embryo was reported just this month [August 2017]. The Gene Machine uses a series of anecdotes to explore the ethical questions that arise with the expanding use of these technologies. For better and for worse, Rochman remains neutral, letting the stories she tells unfold with little comment, thus allowing readers to form their own opinions. As she admits in the introduction, “This book is not about right or wrong answers, only extremely personal and intimate calculations.” As a scientist myself, I appreciate Rochman’s attempt to let the information stand on its own, but I found myself wanting to know her take on the issues she presents, especially since we know she herself has struggled with genetic-information overload. Rochman circles around these questions, diseases, and technologies, thoroughly considering all the ethical and economic issues surrounding them, but confusing the hell out of the reader at the same time. When discussing PGD, for example, she begins by comparing stories from mothers and daughters with a BRCA1 mutation to see if they would use this technology to prevent passing the risk of breast cancer to their children. Jennifer Davis would do it in a heartbeat, but if her mother had used this technology (had it been available at the time), Davis herself wouldn’t be here today. But then the chapter evolves into a discussion of designer babies. If you can use PGD to prevent disease or risk of disease, is it ethical to use it to prevent disability? And while she’s talking about preventing disabilities, what about the parents who want their children to share the same disability they have, such as deafness? The chapter ends with a discussion about disabilities and abortion, abortion being the subject of the following chapter. The transitions from one fascinating topic to another read beautifully; at no point does the reader feel like Rochman has left them hanging on a cliff. And yet it’s extremely difficult to remember exactly how you got to any one particular topic. The writing often resembles a stream of consciousness more than a linear story. These anxieties seamlessly lead into the next chapter, “The Right to an Open Future.” Should our children know they have a mutation that increases the risk of a disease that they may or may not develop as adults? Would this knowledge cause undue anxiety, casting a shadow over their entire lives? Jonathan Berg, a geneticist at the University of North Carolina at Chapel Hill, believes genetic results should be divided into four categories: “ ’childhood onset’ conditions, childhood onset conditions that have no treatment or cure, adult-onset conditions that can be treated or mitigated, and adult-onset conditions that have no treatment or cure.” Childhood onset conditions with treatments, Berg argues, should be conveyed to parents automatically. Parents, however, should be given the option to choose to learn if their child has a disease with no treatment or cure available. Once children turn 18, they could request the results of the adult onset conditions. This system would present a neat solution to a problem Rochman rightly identifies. “While some parents wrestle with unwelcome genetic information,” she notes, “those who’ve long been tormented by an absence of answers are often grateful for any and all knowledge.” I found this nuanced answer to be smart and satisfactory; I just wish Rochman would be willing to say so, too. 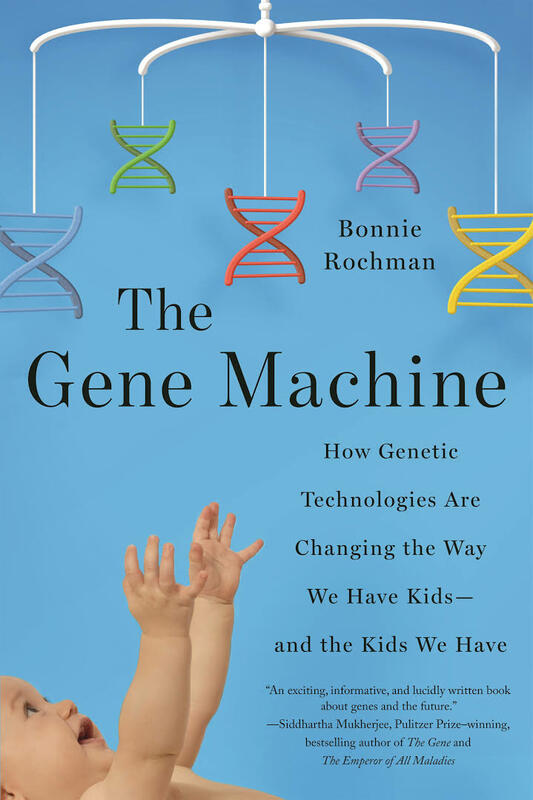 Rochman’s clear descriptions of the basics and complexities of our DNA and genes make the book worth reading, especially for parents or couples trying to conceive, as it gives them a cautionary overview of the kinds of dilemmas they may encounter in the doctor’s office. As a prospective parent, I think it’s important to consider what information I want to know about my children as it pertains to their health, especially when that information may only increase my anxieties — and I wish Rochman had let us in on what conclusions she drew for her own family. An informative but steadfastly neutral primer, The Gene Machine leaves readers to make their own choice. Evelyn Litwinoff has a BA in Molecular Biology and Biochemistry, an MS in Pathology, and is about to complete her PhD in Biomedical Sciences. She is an avid follower of parenting writings and blogs, and hopes to become a mother herself someday soon.